Cutest purple bag ive seen. You look so pretty Mica! Love this first dress, so cute! Purple is my favorite color so I'm loving all of the purple here. And the black/white combo with the purple bag is so striking! Good luck at the birthday party this weekend - hope everything goes to plan! I love that you let your boys help pick out your clothes...that's such a great idea, Mica!! And kimonos are one of my go to's in the summer!! They cover nicely but aren't too hot!! Great outfits, and have a wonderful weekend!! Yes, they do a good job sometimes! :) I really like these kimonos they picked! Aaaaw...your boys did well picking out the kimono, Mica:) You look fab in both outfits. You really do know how to style maxi dresses! Thank you! They did really well! Glad you had a great mother's day. Kimono's are a must have in any closet. Like you said you can do so much with them. I even wore my kimono when I was pregnant. Have a great weekend. Yes I loved mine so much in pregnancy too! This is a perfect combo for the autumn months. I like both pairings. Glad you had a nice mother's day. That is so sweet that your boys picked out the kimonos! Good choices and of course they're perfect in your wardrobe! Yes, they picked such great pieces for me! The pop of purple is a really good idea, I love the shape and style of the bag too - lovely post and great outfits by the boys! The mini mab is such a cute bag! I wanted to love it, but felt like it was just a bit too small to function as a daily bag for me. I still think about it though, haha. It is a cute bag, but definitely too small for an everyday bag! I really like it just for the essentials! With it being a kimono sale they really couldn't go wrong, haha! It would be fun if they got some makeup for you! I do like how you paired the kimonos with maxi dresses. Both outfits are stylish and pretty. The mini purple bag is very pretty. Have a great weekend! I hope all goes well with the birthday party. Love these two kimonos you've got here. 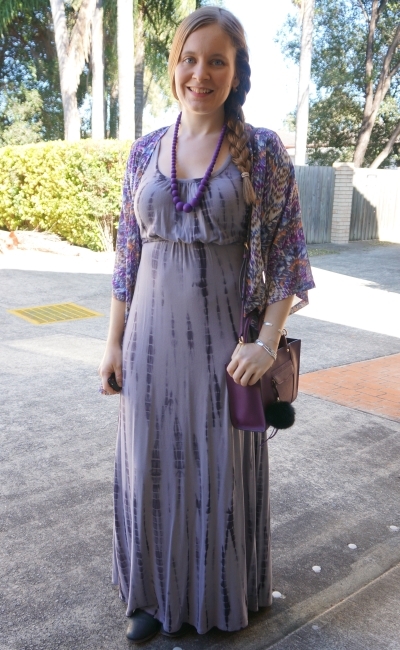 I really like the purple look with the tie die dress! Hi! I always adore your maxi dresses! You look beautiful and as always you accessorized it perfectly. Kinomos are great layering pieces and you have a cute collection. That was so super sweet of your boys:) I pray you and your family have a wonderful weekend! Thanks Tiff! It was so sweet of them! That kimono is so pretty! I love all the prints and floral tones that scream summer <3 that bag is also super cute and I've been meaning to look for a similar design. I'll need to take note of the colour too! They are great for autumn here too - it's cold here in Brisbane at the moment! Aww, I love that your boys picked out those kimonos for you, what a sweet gift. Plus, they did a great job, I love those fun prints! They did pick such nice prints! Your default outfit is a very chic one. I love the mini Mab it in that pretty purple color. I am so glad you were able to enjoy Mother’s Day and you were spoiled by your family. Well deserved! I love the Kimonos that the boys picked out ! Thanks Elle. Hope you had a lovely mother's day too! What a gorgeous bag, I really like the shape and style and the colour is beautiful! Great pictures too!! That second outfit is stunning! 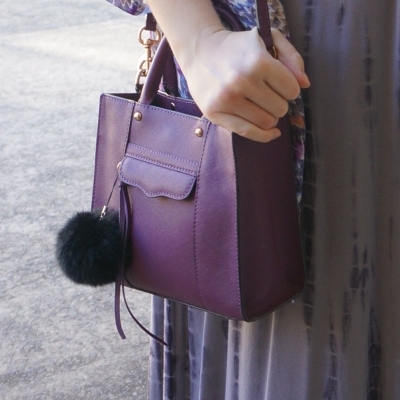 I adore the purple tones to it, and of course love the bag! How cute that the boys each picked out a kimono for you! That's a perfect gift for you! 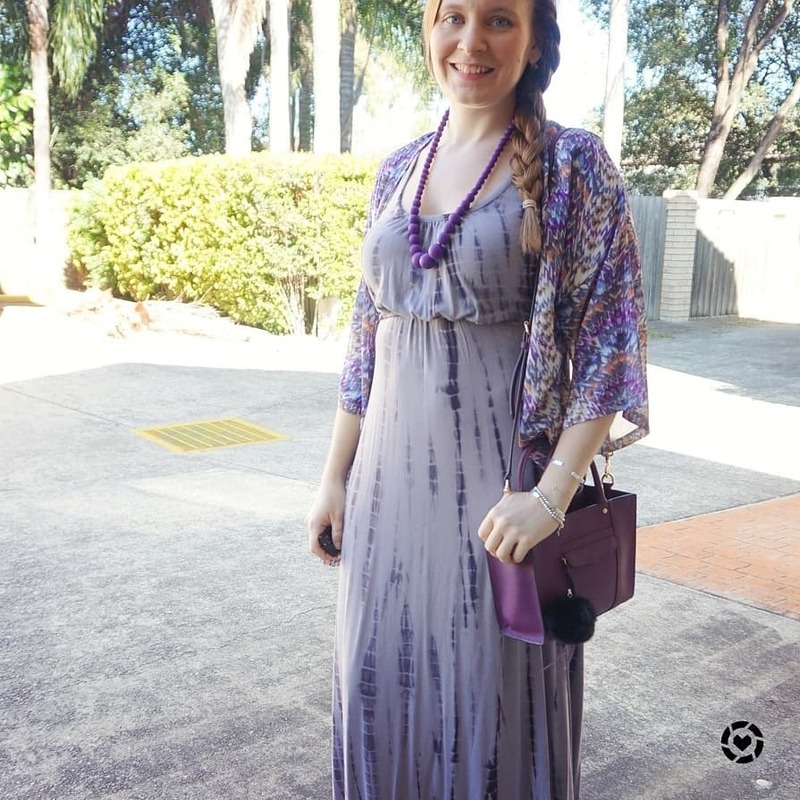 I never would have thought to pair kimonos and maxi dresses, but they look great on you! I kind of want to raid your closet someday - you have such a great collection of maxis and purses! Love both looks, as usual! haha thank you! I love both maxi dresses and handbags! You know i m a big fan of kimonos too. I have several. I like most the second look and i think your boys would be proud of their mother. Thank you Marisa, very kind of you to say! The kimono with the black dress looks outstanding Mica ! 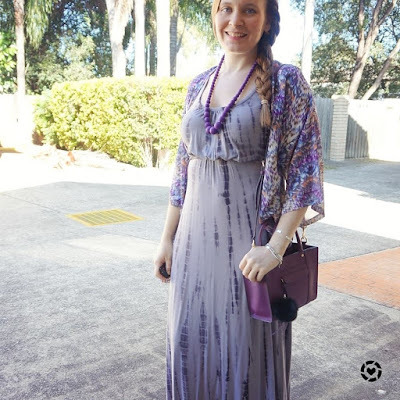 I wore a kimono over a maxi dress a few months ago and it was inspired by you. Such a cute tote, and I love that it's purple! I have a plain black maxi dress and for some reason never thought of add a kimono, but I love it! All the purple in your second outfit works so well together! They are both beautiful kimonos! Glad I could introduce you to the idea! That bag is so pretty and the colour of it is gorgeous! Love the first outfit because you can never go wrong with a plain black maxi dress! There are so many ways to style it. Very true! A black dress is a staple! So loving your kimonos, the prints and colours are very attractive. Nice to see them paired with maxi dresses too. Wishing you have a happy and fun long weekend. Good to know that all went well with the birthday party! 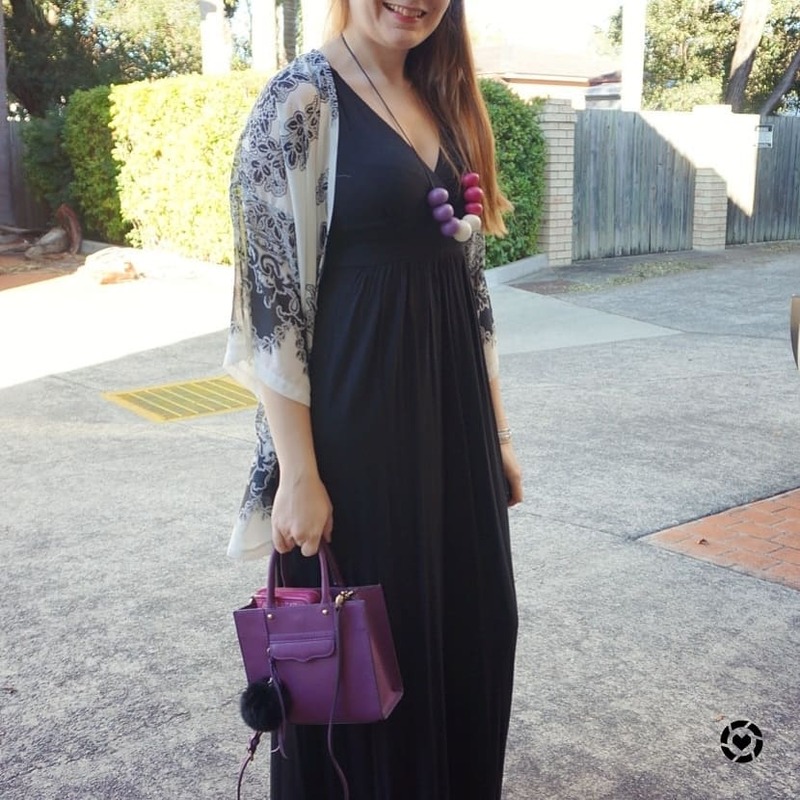 Lovely kimonos, and styling with these maxis, Mica! I saw a bunch of kimonos in my shopping adventures, but resisted due to Vizzini-tempting fringes and beads! I was thinking of yours - it was so hard not to get them! Your kimono is sooo pretty! Love the color of that bag so much! And I love the kimonos with both dresses. I agree that they are a great transitional piece when worn this way! Definitely boho chic! How adorable that your boys chose the kimonos! They definitely know how to pick cute ones :) Your Mother's Day sounds wonderful! Hubby let me sleep in, that was just what I needed that day! I love your purple maxi! Thanks you all for the kind comments!